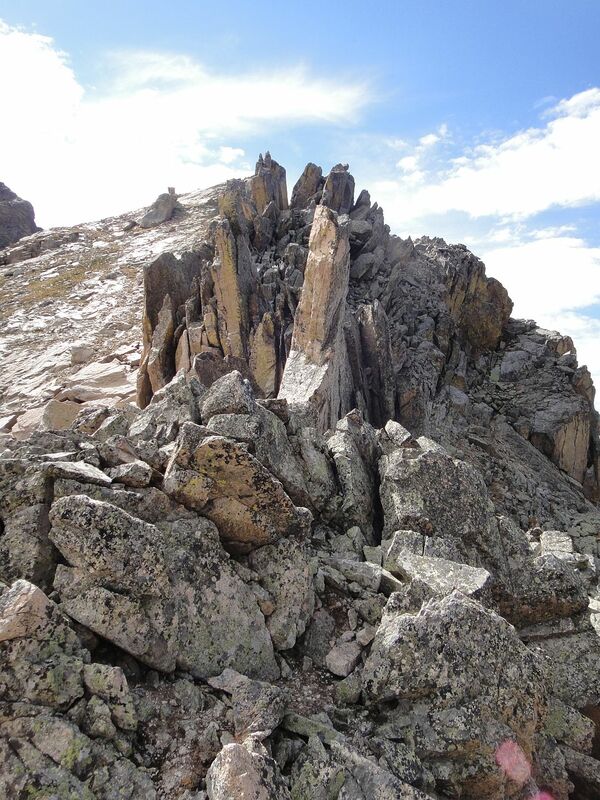 Hiking Rocky Mountain National Park: The Lumps of Lumpy Ridge Part Two. I try not to write too much about personal stuff on here. I want this website to be focused on RMNP and my experience there. It's been almost three months since I've written, and my life has changed alot though my love for the mountains still stands. My wife and I bought a house finally, and with the generous help of our parents on both sides. It is nice to have something that is ours. I must say I actually enjoy mowing the lawn. But this almost didn't happen, because a week before we were scheduled to settle, I got fired from my job of almost four years. I'd never been fired before and it stings. But in the end I can't say I am unhappy about it, as I hadn't been happy working there in a long time. In fact, I'd been looking for a new job for over a year. But this did put a halt on the home purchase, as I'd have to have verifiable income when we signed the papers. And we already gave notice to our landlord, and he'd already found someone to move into our place. For a few days it looked like we'd have no where to go. If not for my mother in law, who knows what we'd have done. But in the end it worked out. On the job front, I found something that pays less and is mindless work. Despite that, I feel happier there. I'd applied to be an emergency dispatcher for the city of Longmont way back in January, and am happy to say that I've been hired, and will start there in mid June. So these few months have brought alot of change. I was more stressed with the job/home situation than I can ever remember being. But it's worked out, and I am looking forward to the future in our new home and to be working for and serving the citizens of Longmont and having a positive impact on peoples lives. To return to the point- my foot injury has been feeling alot better. I joined my friend Dan for a hike two weeks ago, and found that while it still wasn't one hundred percent, it no longer hurt to push off or land on my left foot. As you can imagine, pain when pushing off or landing on one of my feet has complicated walking quite a bit! I did a hike with the dogs the next week, and with some mountain bike rides sprinkled in between, decided that I was feeling good enough to look to the park this week. But I needed something shorter and lower elevation. Thus I turned my eyes to Lumpy Ridge. I could summit five named peaks there, four of which are technical climbing destinations. I started early on Memorial Day to beat the crowds. I got up early enough to catch sunrise from the trail, and the sight of alpenglow on the high peaks. A view that never ceases to inspire. Here are three of the points I would visit over the day. You can see Fin City almost directly under the branches of the dead tree, Crescent Wall in the center, and Pacman Crag to the right. I would be going for the easiest approach to the top of these, which is what would commonly be used as a down climb from the technical stuff. Even so, these points went at 5.0, 3rd class, and 5.2 respectively. The disclaimer is that I would suggest against trying these unless you are comfortable with those difficulty ratings. Though these points were easier to find than those I visited on my last foray to Lumpy Ridge, a GPS may be useful to help locate them. After some inspection, I decided I would save Pacman Crag, the hardest of these climbs, until the return trip and moved on to Crescent Wall. I made my way though some forest, brush, and granite boulders until I could get onto the mellow ridge that runs west from the summit. From here it was pretty easy movement to the top. I was able to get a great early morning view of the Estes Park valley. I love the long shadows in this photo. And I could see my own shadow to the west, with Pacman Crag on the left. From here, I looked to Fin City, the feature in the middle of this photo. And aptly named, because the rock looks like Orca fins sticking up from the ground. I exited Crescent Wall and make a short bushwhack over. I walked around the feature just to check it out. I think the easiest route on the front side is 5.7. The backside looked much more tame and was a fun little climb. I did not use the tree someone had placed here! Crescent Wall from Fin City. Sitting on the summit of Fin City, 8780 feet. While it was the summit, it was still pretty airy, with the potential to fall 30 feet or more down one of the cracks between the fins. From here I would head to East Gemstone, a peak that appears only one place that I can find. It's not in Fosters book, or on LoJ, but Estes locals have named it, and it looked like it would be a fun climb. It looks like you can just walk up it from the north side of Gem Lake, but a deep chasm stands in the way. I'd tried it once before, but turned back due to snow and water on the granite. I decided to just head directly to it and see if the gully pictured to the right would go. The gully. It worked. Don't take the earlier exit that requires climbing, as there is a chasm that requires going around on the other side. You'll find several along the way. The last one either requires a fair amount of down climbing to get to a point lower on the slabs to continue, or a few fifth class moves to move to the summit. I'd say these few moves were the hardest climbing I encountered over the day, but will refrain from giving a grade. The view from the top is excellent, with Middle Gemstone and West Gemstone (aka Gem Peak) immediately visible. And of course Gem Lake at the bottom. I'd yet to see anyone beside two people in the parking lot, and could see there wasn't anyone at the lake. That would change by the time I returned. The summit of East Gemstone. I decided to drop down to Gem Lake by heading north. I ended up working down a gully and then moving on the slabs as I could. I stopped here to empty my shoes, and started down. There was a dead tree right next to where I took this photo at. A few steps down and I came face to face with this branch. Someone had come this way, and a long time ago since the bark had grown over their initials before the tree died. I love finding stuff like this out and about. I could see the faint remains of someone else to the right of the first. Once I hit the trail, it was over to continue on to Cow Creek. I would visit Kellogg's Krag, a fourth class destination near the Rabbit Ears campsite. I went to the campsite first and then headed west, steadily gaining altitude. I stayed on the south side of the feature, but took the north side on return. The north side is easier, and there is a faint trail if you can find it. The view from the summit of Kellogg's Krag, 8685 feet. I saw several hummingbirds on the way to the top. Pretty cool animals. Unfortunately, this is where I started to feel some distinct pain in my foot. Of course I was about as far from the car as I could possibly get. I'd just take my time to get back and deal with it. I guess this might be how things are this year, but hopefully it will continue to feel better as time goes on. I stopped at Cow Creek and took a few Ibuprofen and dunked my foot in the ice cold water of the creek. I lasted about ten seconds before it was numb, but the freezing water felt good. Uphill I went, and as I moved, things started to feel better and better. I've noticed that when I am on a more level surface things feel pretty fine, but it's when I am on something more uneven, like bushwhacking or rock, it can hurt. I saw a few people on the way back to Gem Lake, and then a whole, whole bunch of people upon arrival at the lake. East Gemstone over Gem Lake. The true summit it to the right here. As I moved down, I was able to get a great view of the main obstacle to East Gemstone being an easy walk up. That's one huge crack! Clouds started to build and I was happy to have gotten an early start. Fin City from the trail. It reminds me somewhat of the rock I'd seen on The Cleaver, though on a much larger scale. It looks almost like dripped wax or Elephant skin. Pacman Crag is pretty close to the trail, but isn't the most prominent thing there. It is also much more difficult to ascend than the high point right behind it. The summit of Pacman Crag. Here are my poles, extended to approximately 40 inches to get an idea of the scale. This looked like the easiest route to the top, and goes at 5.2. I took the crack up to a crimp on the left below the prominent rail. From here, I could reach the rail, got up onto it, and moved right to the large angling crack on the right. There wasn't much for handholds, but friction worked well enough. I was pretty impressed that my new trail runners didn't slip once during the day. Good to know. I down climbed the same way I went up, and got back to the trail. Now it was simply motor back to the trailhead. I passed a bunch of people on the way down, some still going up despite the imminent look of the weather. Of course it started to rain right as I got back to the car! This was a shorter but fun day, particularly good for those of you who enjoy scrambling and feel comfortable moving in fifth class terrain. The destinations east of the Gem Lake trail are all relatively accessible, and can easily been seen from the trail. Kellogg's Krag is a bit more involved, but if you can find that thin trail to the north of it, it's not too bad. Lumpy Ridge is a fun place to spend some time, easy to get to, and offers great views in all directions. Pacman Crag, 8500 feet: 1 mile, 648 foot gain. 5.2. Moderate. Crescent Wall, 8740 feet: 1.3 miles, 888 foot gain. Third class. Moderate. Fin City, 8780 feet: 1.5 miles, 928 foot gain. 5.0. Moderate. Kellogg's Krag, 8685 feet: 4.8 miles, 833 foot gain**. Fourth class. Moderate+. As a whole, this hike covered approximately 9.8 miles with 3000 feet of elevation gain. I'd call it moderate plus in difficulty, but it does include sections of fifth class which requires some special skill. *= Easier third class approach from the north starting at Gem Lake. **= You go over Lumpy Ridge and back, so there is more gain. This could also be done from Cow Creek/McGraw Ranch for a shorter approach and less elevation gain.